This DMX unit is controlled by his inside CPU. 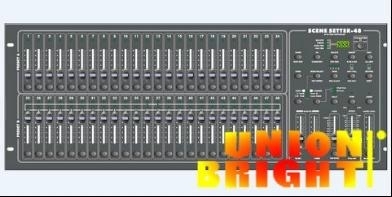 All 48 channel can do the dimming work. 96 edit programs ,each of which can store 999 steps. 4600 steps(max.) memory space. The programs can be triggered by auto mode , or controlled by audio signal coming from built-in mic or outside. Running speed and fader time are adjustable. All the stored data and program are protected by the built-in battery. After setting the DMX 512 address, you can control any light that has been connected. 3 digital LCD display shows the operating process. 3 Pin XLR DMX socket for DMX output. 5 pin Din plug for MIDI input/output/through.